Camping is a fun way to experience cooperative group living in the outdoors. It uses the natural surroundings to contribute significantly to physical, mental, spiritual, and social growth. 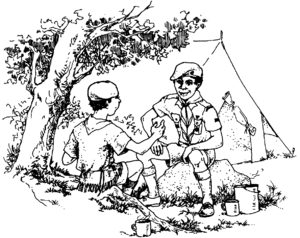 Camping introduces Cubs and Scouts to various knowledge and scoutcraft skills that is useful as a Scout and beyond. It is important to find the right balance of being prepared, and not over-packing for camp. Here is a guide, however you will need to adapt this for the particular camp requirements, and weather conditions. All kit should be packed in a bag/rucksack. No need for electronic games or devices. Cellphones to be switched off and handed in at arrival for safe keeping. See Scout Recipes for some ideas. 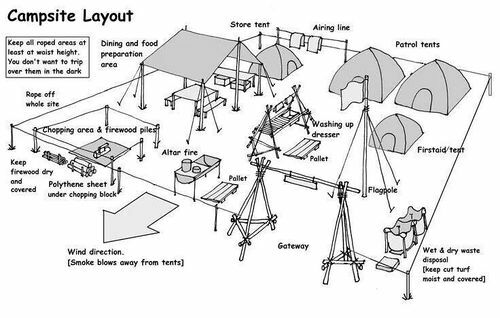 You could plan 'camp' indoors in a bungalow, outdoors in tents, or you could have a Backwoods camp (survival camp) where you camp in shelters. 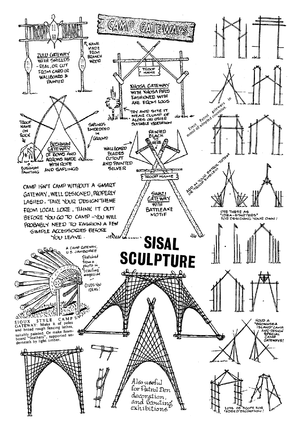 Have a look at the various Scout Campsites available to Scouts. Keep the fire well clear of the tent and food store. Think which way the smoke is going to blow. Your chopping block and woodpile should not be in the main pathway. Decide how you are going to dispose of rubbish. If you dig a wet pit, don't make it a booby trap! All tin cans, plastic cartons, etc. must be collected in proper litter bags and taken home for disposal. Latrines should be positioned downwind and away from rivers or water sources. If you are using a river for your water supply remember to take the drinking water upstream; then the swimming area with the washing area downstream. As a Scout and a camper, you should be following the Scout Outdoor Code. A campfire is a great way to build morale and have fun. This page was last modified on 15 October 2018, at 22:54.